(Bloomberg) -- A young and energetic Democrat, running on a message of unity, catapults over more experienced rivals to victory in the Iowa caucuses and goes on to win the presidency. Barack Obama did that in 2008, and Beto O’Rourke is trying to replicate the magic. But the former Texas congressman confronts a challenge: Many Democratic voters are looking less for hope and change and more for a combative candidate to channel their anger with President Donald Trump and the political system. In Iowa this week, Democrats, old and young, said they saw parallels between the messages of O’Rourke, 46, and Obama, who was 45 when he started his bid for the presidency in 2007. Despite the animosity toward Trump among Democrats, the lure of sweeping liberal proposals and combativeness being offered by other candidates, there remains an appetite in the Hawkeye State for compromise and healing divisions. For the second time in the month since announcing his presidential campaign, O’Rourke was traveling this week through Iowa, which next February will hold the first contest in the nomination race. He plans to campaign in more than 10 cities in the eastern part of the state over five days. “Iowa is critical for anyone who wants to be the nominee,” O’Rourke said Friday in Storm Lake. Speaking to the crowd at Morningside College, O’Rourke touted the importance of compromise and said the most enduring solutions aren’t “imposed by one political party alone.” The U.S., he said, has “never been as polarized or divided or riven by partisanship as we are in this moment — at least not in my lifetime” and that he wants to “dissolve” the divisions. 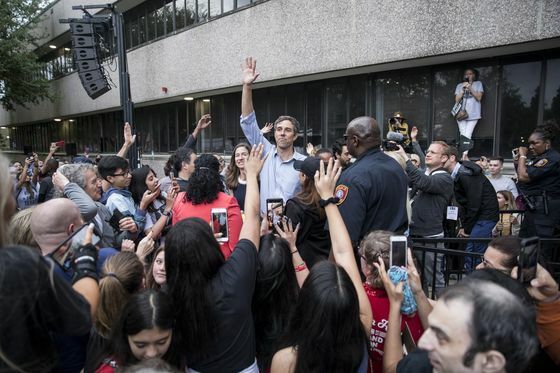 Much like Obama did in 2008, O’Rourke is making an appeal to progressive voters with an positive message while steering clear of the most left-wing ideas gaining popularity in the party. He has faced criticism — and questions from Iowa voters — about his lack of specific proposals in contrast to some of his rivals. The Texan said Americans should have “the choice” of Medicare, but didn’t propose to replace the private insurance system, as have two of his rivals, Senators Bernie Sanders and Kamala Harris. He said he wants immigration authorities to de-emphasize enforcement against undocumented people who aren’t committing crimes, but assailed “open borders” and wouldn’t call for abolishing Immigration and Customs Enforcement, in contrast to some of his opponents. He speaks frequently about the need for aggressive action to combat climate change without mentioning the Green New Deal, which has been a lightening rod for critics. “I was a strong supporter of Barack Obama and I see a lot of that in him — the enthusiasm, the inspirational way that he talks,” Terry Waugh, 69, said after O’Rourke’s event Thursday in Sioux City. Yet for Waugh and other Democrats, the experience with Obama was bittersweet. His promised unity -- economic, political, racial and cultural -- never materialized, and progressives blame that on Republican intransigence. That’s put many voters in the mood for a different kind of candidate -- one who’s more combative like Sanders or Senator Elizabeth Warren, who aren’t pitching a message of compromise, but rather that the system needs to be turned on its head. Dan Pfeiffer, a former top Obama adviser in the campaign and the White House, said candidates must offer a message suited to the times. Waugh said he’s deciding between O’Rourke and Warren in the caucuses. O’Rourke turned heads Thursday after he compared some of Trump’s remarks about immigrants and Muslims to the rhetoric of Nazi Germany. He stood by the charged reference, saying that if Americans fail to “call out racism” then “we are going to continue to get its consequences,” such as rising hate crimes. Most early polls put O’Rourke in the top tier of Democratic hopefuls, bunched up with Harris and Warren. All three are well behind Sanders and Vice President Joe Biden, who hasn’t yet announced a campaign but has given strong indications he’ll run. O’Rourke has demonstrated his power on another metric -- fundraising. His campaign announced earlier this week that he’d raised $9.4 million in just 18 days following his formal entry in the race. That matched the pace of Sanders, who has a national following and one of the biggest online donor lists in politics as a result of his 2016 run for the nomination against Hillary Clinton. Some Democrats wonder if he is progressive enough. On Friday night in Grinnell, a college town, a woman said he had often voted with Republicans and wanted to know on what issues he’d refuse to cede ground. O’Rourke said he worked with the GOP on things like enhancing mental health care for veterans, and cited abortion rights and LGBT rights as issues on which he’d never compromise. Sara Castro, a sophomore at Grinnell College, asked O’Rourke if he supported free college for all, another popular idea among progressives. He said he did not and suggested a more modest approach. In Storm Lake, Marty Gallagher, a 49-year-old business owner, said he’s looking for a balance between a fighter and a uniter. Most important, he said, was a Democrat who can defeat Trump.